Product code: P998 Categories: Sold Items, Sold Pocket watches. What a wonderful piece of history that you can hold in your hand, admire, appreciate and be amazed at its age and the fact that it still works today. This very handsome antique pair case fusee driven pocket watch with verge escapement was made in 1825 by Robert Wilkie. 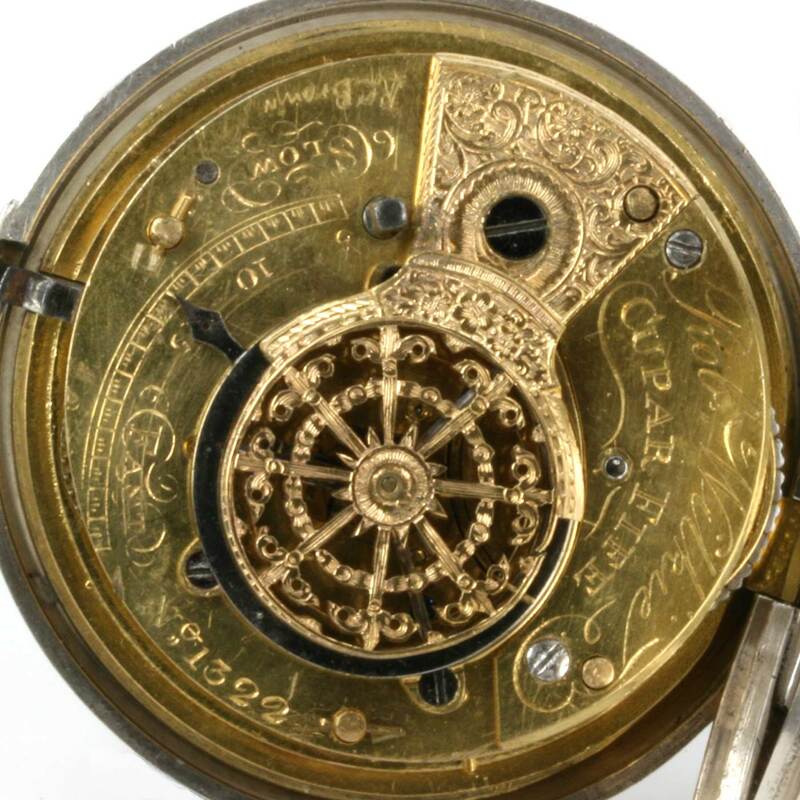 Robert Wilkie was situated in the town of Cupar Fife in Scotland and worked from 1792 to 1830 producing not only pocket watches but also clocks, specifically long case clocks and here is a wonderful example of a pair case pocket watch from the Georgian era. A pair case pocket watch is as the name implies one where there are a pair of cases – one to hold the pocket watch itself, and the other as a removable protective cover. Both cases are made in sterling silver, and the outer case measures 76.4mm across by 78.5mm high and the pocket watch case measures 50mm across by 57mm to the top of the bow. The dial of the pocket watch is still so easy to read with the traditional black Roman numerals on the white enamel background and has only very minor small hairline cracks however for a pocket watch that is coming close to 2oo years old, it still looks superb and even adds to the character and charm even more. At the back of the pocket watch case is a hole to wind the fusee movement and the time is set by using the key to turn the hands. The movement of this pocket watch has been completely overhauled and serviced and keeps surprisingly accurate time thanks to both the quality of the movement when it was made and the skill of our watchmakers. It is one thing to get an antique pocket watch that looks good but doesn’t run or doesn’t run well compared to one that has been expertly serviced and repaired and not only looks good but keeps time as well. 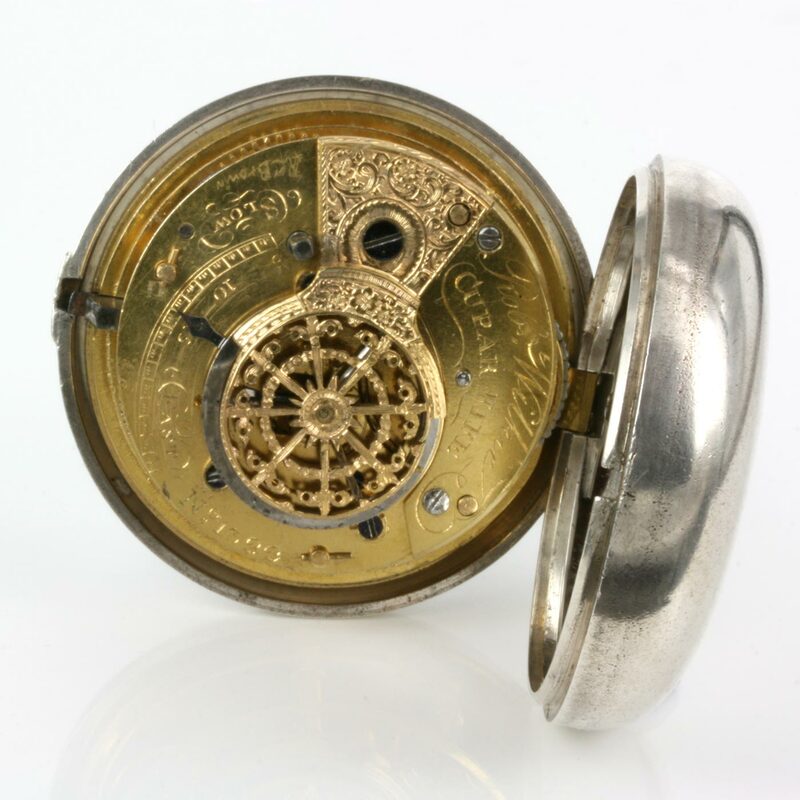 This is a lovely example of an antique pair case fusee movement pocket watch that will always be great talking piece.